Hello! Marissa from Rae Gun Ramblings here today, lover of all thing Harry Potter, eater of fried foods, and faithful St. Patrick’s Day celebrator! 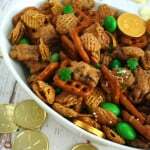 I’m super excited to be here to share a easy recipe for St. Patrick’s Day Chex Mix. 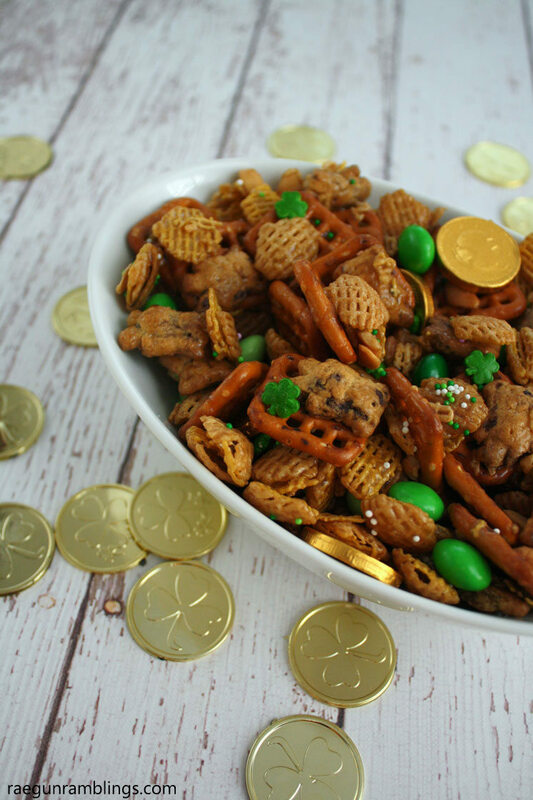 This snack mix will have your friends and family begging for more. Really it’s one of my most requested recipes when I make it for get togethers. Combine first 4 ingredient on a jelly roll pan (I like these because the lip keeps the stuff from falling off when you stir). I found it was easier too leave it mounded (not spread out) for the next step. Combine brown sugar, corn syrup, and butter in a small saucepan; cook over medium heat 2 minutes or until sugar and butter melt, stirring constantly. You don’t want to cook it so long that it thickens because then it’s harder to coat all the pieces. Remove from heat; stir in vanilla and salt. 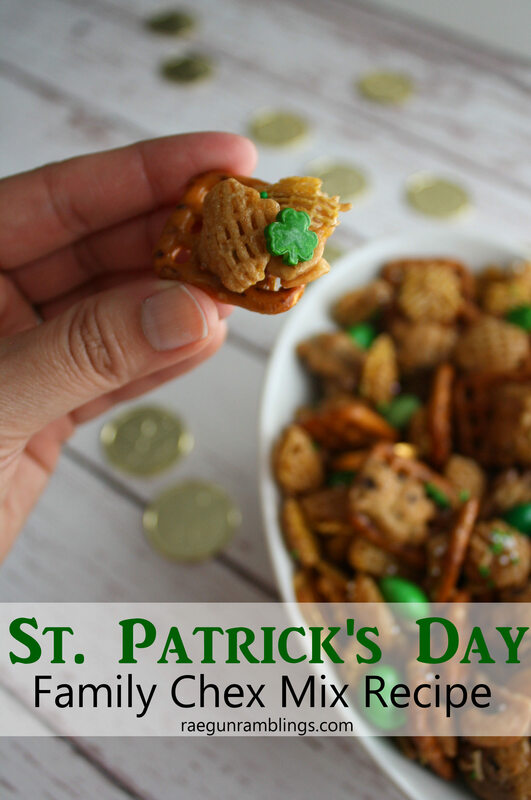 Immediately pour syrup mixture evenly over cereal mixture, tossing quickly to coat well. Bake at 250F for 1 hour, stirring every 15 minutes. Have your sprinkles open and ready when you pull the cookie sheet out as the mix cools fast. 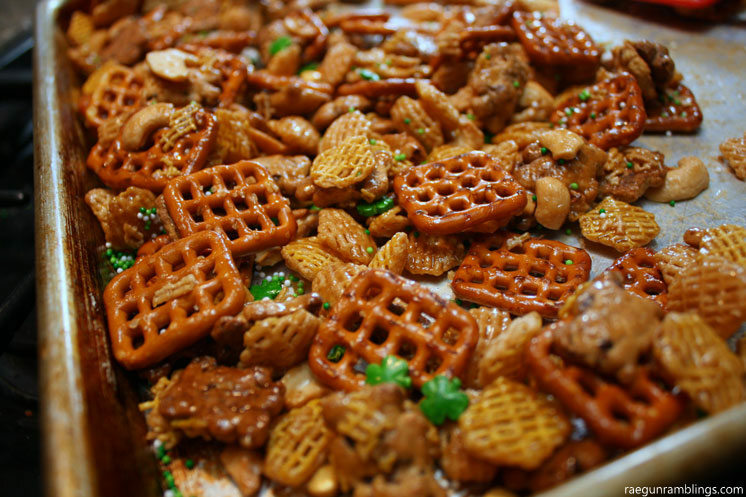 Sprinkle generously then spread warm snack mix in a single layer on wax paper to cool. 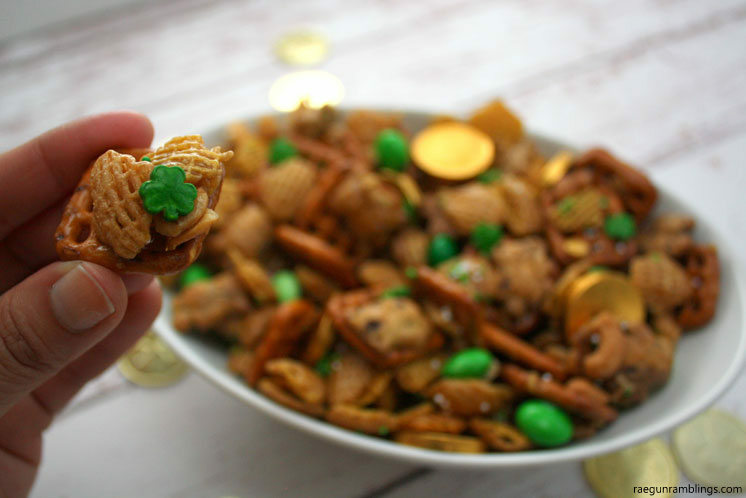 Break cooled snack mix apart. When ready to serve or gift add in remaining ingredients. This stuff is SO good! 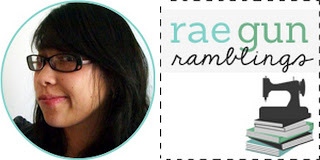 I hope you give it a try and swing by Rae Gun Ramblings and let me know what you think! 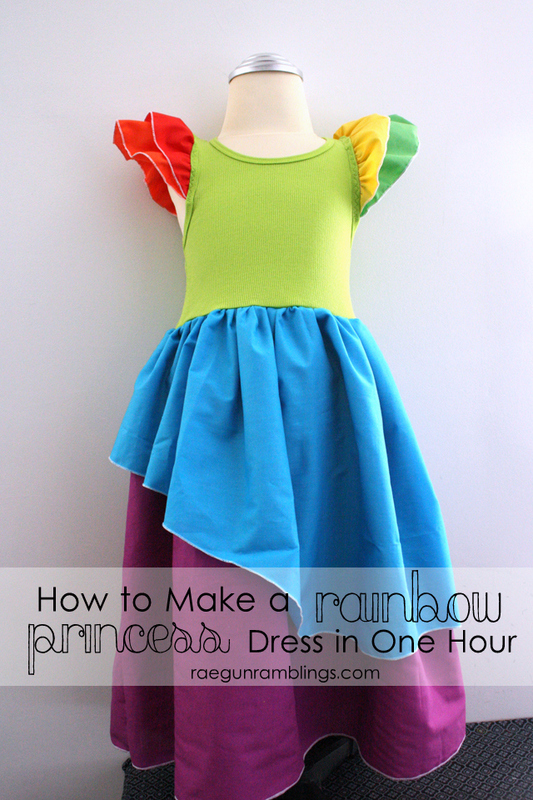 If you want some more fun projects to celebrate St. Patrick’s Day this easy Rainbow dress can be made in just and hour and is one of my all time favorite projects. 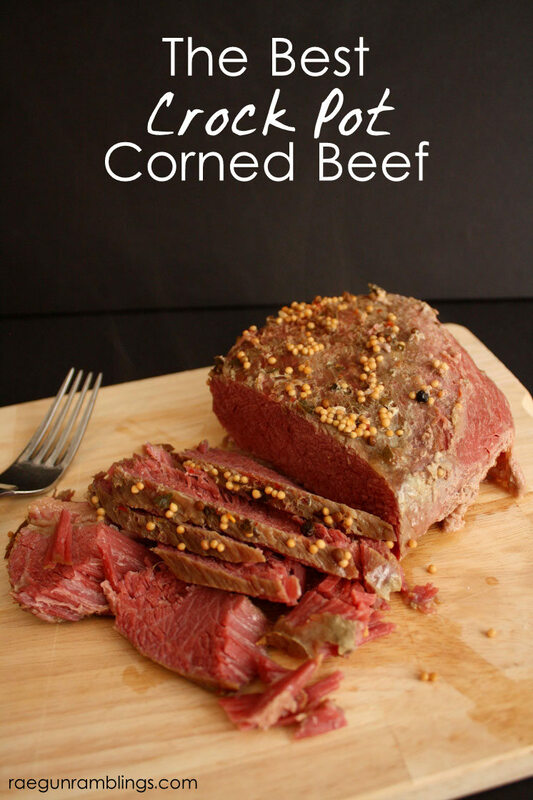 And you can’t have St. Patrick’s Day without Corned Beef and this crock pot corned beef recipe is the best! If you’re not a fan of corned beef or want something extra like we do make sure to check out my 30 minute Shepherd’s Pie recipe.